Looks like the picture was taken in the living room at my grandfather Lemuel's house. 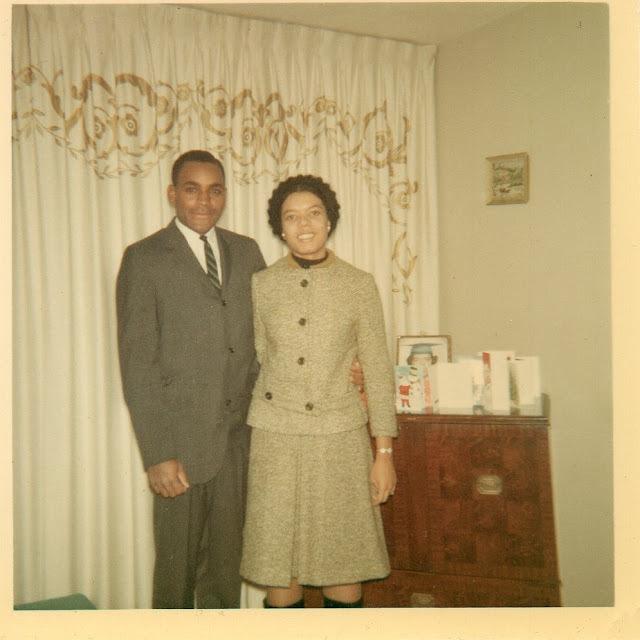 My parents met while attending school at Hofstra College (now Hofstra University) in Hempstead, Long Island. I love this picture because they look so handsome and happy. They have that glow that comes with having their whole life in front of them. Lovely picture, you look like your mother. I sure do see you in your Mother! Such a handsome couple! Lovely photo Andrea! Reckon they seem to also glowing with the happiness of having found "the love of their life" :-) ... Am wondering if this is your mum's Graduation Day because of the photo and cards on the Dresser behind? Lovely picture!!! I love pictures like this. They do look happy & gorgeous. What were they like? I think you do have your dad's eyes in your mother's face.